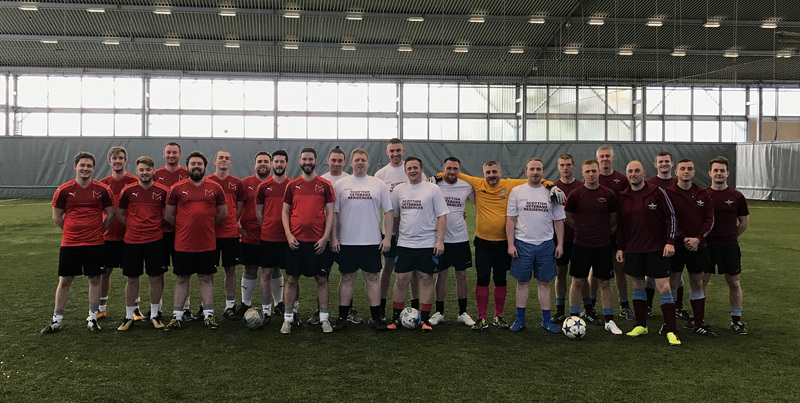 Friday saw our annual 7 aside charity football match with our chosen charity partner, Scottish Veterans Residencies take place at Toryglen Football Centre, Glasgow. Following on from the success of last year’s event, MAST lined up against the Scottish Veterans and a team from the Paramilitary in a round robin tournament. The teams battled it out in a set of tightly contested affairs with each team playing each other twice over the course of the afternoon, with SVR claiming top spot, Paramilitary in second and MAST, finding themselves in the trenches, propping up the table (only just though!!). Post-match analysis was inevitable, but only after the raffle, containing much sought-after prizes such as Restaurant Vouchers, Prosecco and Tunnocks Caramel Wafers.